The end of the world? That’s the stuff of Hollywood blockbusters and deep philosophical exercises in school. No need to sweat it. 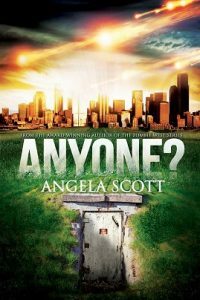 So when sixteen-year-old Tess’s doomsday-dad builds a bomb shelter in their suburban backyard, everyone thinks he’s gone crazy…. …Until fire rains down from the sky, sinking whole cities into colossal craters and setting much of the world ablaze. Tess’s dad gives her a few short minutes to gather her emergency bag and her freaked-out kitten, then leads her outside and into the underground shelter. Terrified, the last thing she expects is for him to leave her there all alone, but he has no choice—he must find her missing brother. Before leaving, he makes Tess promise to keep the hatch door shut, not to open it for anyone but him, and to stay put until he returns. But he forgot to tell her one thing: What is she supposed to do if he never comes back?